This week the Diva wants us to do "Something Blue" in honor of her Mom's favorite color. It's one of my favorite colors too. It was fun adding color to my mandala, but I could not help my self and added more than just blue. 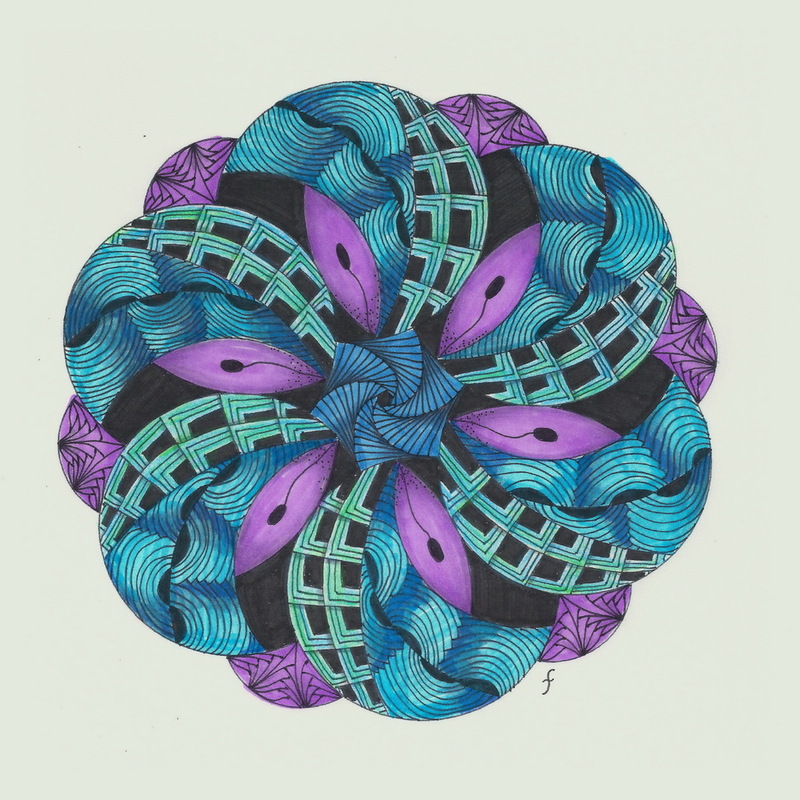 If you like this mandala, you can find the template for it under the appropriate tab above. It's template number 4. Feel free to use it or any of the template shown on that page. 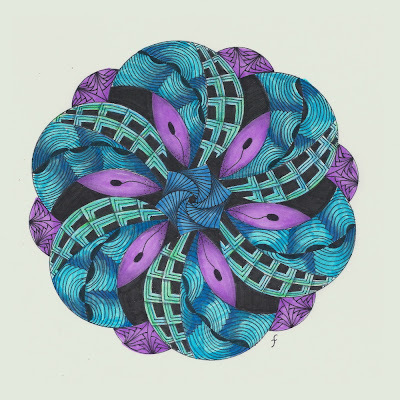 This is wonderful Joni - love the tangles you chose and the mandala is a favorite. I'm going to try one of your templates this week - thaks for sharing! This is amazing, Joni. The balance of colour is really attractive. oh you make me feel like a toddler with a crayon. Someday I will post masterpieces like this. Until then I will admire yours. Beautiful! The colours look really great together. This ia a Beauty! Love how you added the purple!! Gorgeous tangles and great combination of colors. What did you use for the coloring? It worked very well. I love the intricacy - beautiful! Sande, I use extra fine bic markers from Staples, and the ultra fine sharpie markers. When coloring with markers, only the lightest colors let the pen work show through. WOW! Can't think of another word! Stunning! This Zendala has a very calming effect on me… I like the colors you chose and the patterns too! Joni, this is stunning! I love the tangles you used and the color is so beautiful! Wow, wow, wow! Just wonderful! This tile is so elegant! Wow... so beautiful. Joni, I love this! The color is fabulous! Yes...WOW! Love the purple with the blue. Love this zendala, great colors !